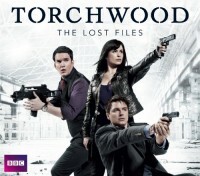 Torchwood: The Lost Files (Radio Drama Box Set) - - review - Towers of Books Come Tumbling Down! I am so, so torn about reviewing this one. I love that we get one more look at Ianto's past and get 'the' moment between Jack and Ianto. It was sweet and sad and made me cry... and yet... the plot holes to keep Ianto dead were just so huge. I know they didn't want to bring him back but they could have. Why, oh, why did they need anyone to remain back with those rocks? They could could have just left them and ran... Five stars for great emotional moments and adding some great info on Ianto's past. Four stars given because, if Goss wasn't mandated to keep Ianto dead by the powers that be we could have had Ianto back.